Grazing management means managing what your animals graze, rather than your animals choosing what they will eat. 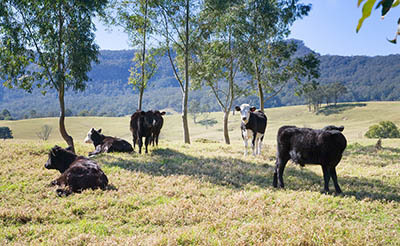 Leaving stock in a paddock too long may remove desirable species through selective grazing or overgrazing, and cause pasture degradation and erosion. Excessively long rest periods or undergrazing may lead to lower feed quality, excessive waste and a change in pasture composition. intensity (how hard) your pastures are grazed. Change your grazing regime from continuous to rotational grazing, prevent overgrazing and allow pasture recovery. Better assess pasture condition, height and groundcover to determine appropriate stocking rates and length of grazing periods. Use grazing animals to manipulate the species composition balance in favour of perennial grasses and to ensure 20-30 percent legume content for high quality pastures. Apply higher grazing pressure in late winter/early spring to prevent legumes and annual grasses from out-competing native perennial grasses. Avoid defoliation of perennial grasses when they are under stress and in danger of dying. Graze to maintain a productive perennial pasture. Develop a grazing plan to manage seasonal plant growth. Match livestock requirements to pasture availability.